VA-11 Hall-A on the Playism Store | Bringing a different breed of indie game to the world. 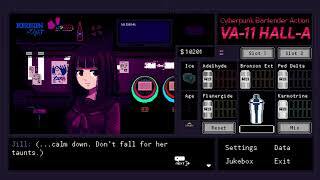 Although there aren't dialogue options, VA-11 HALL-A creates a storytelling experience that's grippingly personal. If, like many game theorists argue, story should always act as a supporter to mechanics, then VA-11 HALL-A is the exception that makes the rule. Never falls into the trap of simply alternating “gameplay” and “story” as so many narrative-based games do; rather, everything you do feels relevant to what is unfolding in front of you. It's through these brief, unguarded conversations that the cyberpunk bartending sim slowly unfolds its story; not of a dystopian world, but of the people living in it. Additional NotesMight work on other OSX versions. Additional NotesMight work on more versions. Important Information!32bit runtime/library is required. What do you think about VA-11 Hall-A? We are a game developer based in Venezuela. Born as a blog discussing japanese pop culture, we took a huge interest in game development and decided it was the path we wanted to follow. Our first finished title was a small visual novel made for our blog’s first anniversary, soon after we decided to take on a much bigger project which proved to be way too ambitious for our skills at the time. Not long after cancelling it, we just focused on making smaller games for contests and that’s how we started VA-11 HALL-A, a much simple undertaking that actually managed to be more popular than our first full fledged project and decided to go on with it. The rest is history. Our name means “delinquent girl” or “delinquent boss girl”, which is pretty cool, we love the concept and feel connected to its rebellious nature.